Issue with creating IPA file. I follow the below steps for creating an IPA file. Selected the iOS project as the startup project. 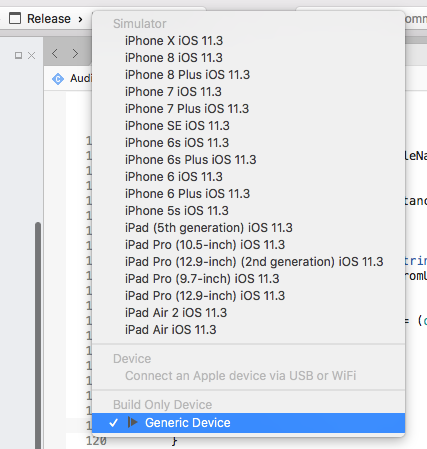 Select the Release | Device configuration in Visual Studio for Mac. From the Build menu, select Archive for Publishing. At this 3rd stage, I am getting a pop-up box and telling "Configuration doesn't target device". I am adding the screenshot of the popup. At the Debug mode device is there but when I changed it to the release mode it is showing the device as Default. @seanyda Solved this issue by following way. @seanyda When I try to select the Archieve option from the Build menu getting the following error. Do you have any comment about this? Sure. You need to create a certificate and provisional profile at developer.apple.com and sign the IPA with it. You can select the provisional profile from the "Bundle Signing" section when you double tap the Business_App.IOS project. Hi now I am uploading the app to app store. That's the identifier. You need to create an identifier with you put in your info.plist. You need to create a distribution certificate as well, and using that distribution certificate you need to create a provisional profile. When creating the profile you will select the identifier and certificate you created. What does that "information" tab show when you hover over it next to Business_App.iOS? That will probably be the cause of the issue. Hi @seanyda Only showing default option at the Release mode, no other options are available. @seanyda On the Debug mode, all the available devices are showing. But no devices are showing in Release mode. @seanyda: Thanks for the information, I am not going to upload the app now, when I upload I will do this. If any doubt I will ping you at that time. @seanyda I am referring the following blog. Can you tell which file need to browse to complete the following step? When I try to create the distribution certificate found that there is a CSR file generation, I follow the below steps for creating CSR file. Within the keychain access, I am not seeing any drop-down window. As per the blog, there is a drop-down window and which have some options. You need to create the CSR in key chain access and sign the certificate with it on developer.apple.com. You can't create a valid certificate without completing that step correctly.